Good morning from Tucson Arena. An ‘it’s here’ feel spread throughout the building as players filed onto the ice ahead of tonight’s season opener – which calls for your familiar 7:05 pm start time at the corner of Congress & Church. 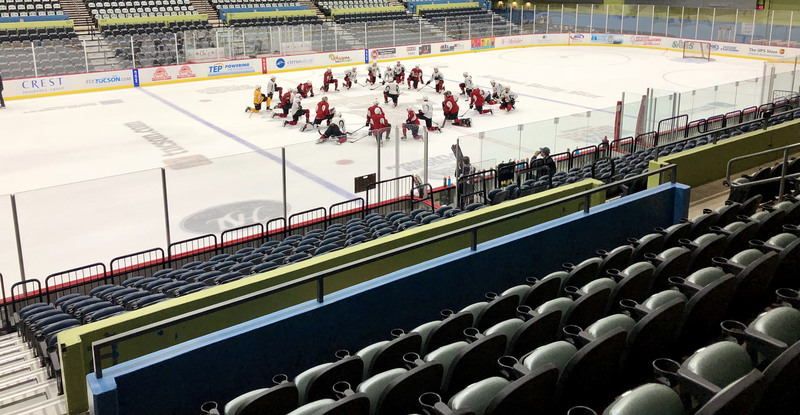 Welcome the San Diego Gulls, who 175 days ago, were eliminated from Calder Cup Playoff contention on this very ice as the Roadrunners finalized a ruthless regular season-ending three-game sweep of their division foe to keep them from claiming the Pacific Division’s final berth. 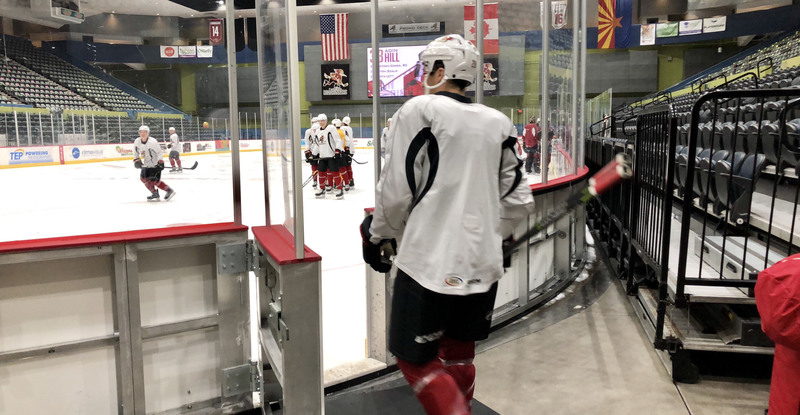 These two clubs have met for season-opening contests each of the past two years, Tucson falling short on both occasions – a 5-3 loss in San Diego at the Valley View Casino Center on October 14, 2016, and a 7-6 defeat at home on October 7, 2017. This, in translation, means Tucson is still vying for its first-ever opening night victory. 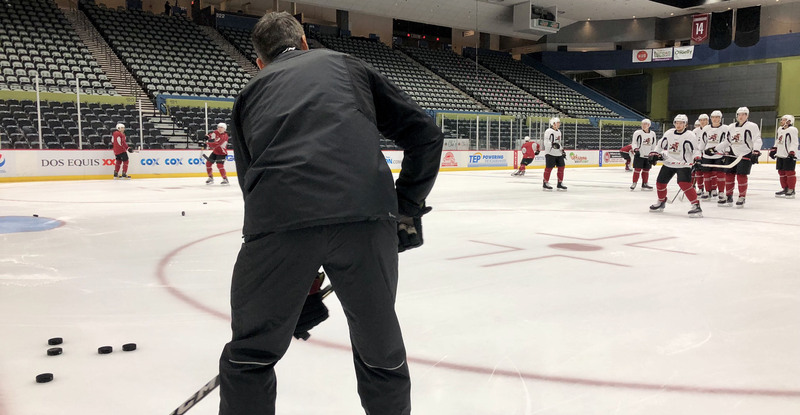 For the Roadrunners, it’s been a mere 148 days since their playoff run came to an end on May 11 against the Texas Stars at the H-E-B Center. A successful season without a doubt, and some of that will be celebrated tonight, deservedly so. Heads up! Two banners will be unveiled prior to tonight’s contest: one commemorating the club’s Pacific Division Championship, the other the team’s Western Conference Regular Season Championship. Fans in attendance will receive a fun-sized replica of the latter upon entering the arena tonight. But we’ll also give it away. Western Conference Regular Season Championship banners to fans in attendance on Opening Night! What’s new? Quite a bit! Of the 24 players included in the release of Friday’s opening night roster, 10 are fresh faces. 14 of the names played in at least one game for the Roadrunners last year. There’s an abundance of youth, as well. With an average age of 22.75 years old, the Roadrunners clock in as the AHL’s second youngest squad, elder only to the San Jose Barracuda. Nine players are aged 21 and under. I think everyone’s excited. I think the first week of the season can be one of the toughest. You’re still coming out of training camp, you’re usually still running hard practices, guys are still moving in, so I think everyone’s just ready to settle in and play hockey. I think the important thing is coming out hard, strong, and playing within our system. You try to grow each game as the season goes on, but certainly you’d like to have a good start to build off of. I think we’ve got a bunch of guys playing in their first American League games, and their first pro games as well, so I certainly feel like I can help the guys and try to lead by example and just try to do my part to help. Last year was great for us, I think you’ve seen it grow every year here, and certainly we’re not the new team anymore where everyone isn’t sure what to expect. While we still keep bringing in new fans, I think we keep gaining from the loyal ones that come back every night, so it’ll be important to keep building on that because it’s important for us as players too.